On Brooks leather saddles, which need careful breaking in, but will prove rewarding. If you persevere. For years. In tears. As anyone will. Still. Unless you take those special pills. That they were sometimes late, and were thus thrown out of the factory gates. the greatest cyclist who ever lived, I feel. Male or female. God gazing down, from a Brompton folding bike. Who’d’ve guessed we’d ever come this far? ...well. at the time it tasted all right. Very curious. In the (with hindsight) odd and innocent world of early 1970s Scottish evangelical folk and rock (now THERE'S a niche!) Paul Openshaw was someone spoken of with reverence and a degree of awe. He was the first person I had ever seen who owned and played a Dobro (a proper one, too, none of your imitations). Always the best of we strummers and pickers, the most questing, and the most dangerous and adventurous in songwriting. By the time we met and he was playing University Christian Union gigs, he was slipping away from Godworld, and describing the experience in painful, devastating songs such as Backslider. Which, to say the least, confused the unregenerate Plymouth Brethren among us. He was at agricultural college, I think, down near Ayr. And then, he was gone. A decade later, so was I. And then, nothing until a few contacts via Facebook over the past year. Paul appeared to be in Dorset, involved (at a senior level? - I don't know) in agricultural feed production. And not only still performing and playing, but, as far as I could tell, still regarded with reverence and awe in his locality. Yesterday an album arrived called The Potting Shed. Just acoustic guitar - DADGAD tuning - and some funny, acerbic, sometimes very moving and powerful songs. That voice, slightly smoothed out and less ragged and scratchy than back in the day. And the only album I've sat down and listened to twice through in succession for, oh...a long time. The guitar playing was always great. Now it's world class. Some internet investigation - and it seems Paul lives a life below the Google radar, for the most part - indicates that he's a bit of a guitar guru these days, conducting seminars on his approach to tuning. No idea how you can get the album. There are only 200 copies and Paul's website - paulopenshaw.com - doesn't work. If you're in Dorset, look out for him at pubs and festivals. However, I did find this on the Acoustic Guitar Magazine site, and some of the songs here are not on the album. A couple deal with the distant past I've talked about. They are wonderful. Everything is coming together for the Mull2Muckle/Fairly Long Ride, which pedals off officially from the Mull of Galloway lighthouse on the evening of 8 June. 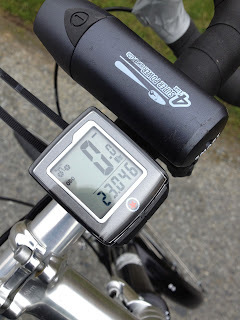 But today, I started with the first 10 miles. Plus 13 for luck. I'm taking a week off broadcasting to do the mainland Scotland section of the ride, but I'm back on air (and hopefully in Shetland) from Monday 18th June. Idea is to get to the most northerly point in the UK (we'll settle for the accessible-by-bike Muckle Flugga lighthouse shore station) on the longest day of the year, which is Wednesday 20th. Cycling and then being whisked back to Lerwick for the radio show doesn't really work easily, so I'm trying to knock off chunks of the Shetland route in advance. Useful, uh, training too! On Tuesday 19th I'll cycle from the Unst ferry terminal to Baltasound, and stay there overnight, cycling up to the Muckle Flugga shore station either first thing in the morning or for midnight! There will be a live link up with the Fred Macaulay Show on BBC Radio Scotland, then I'll shoot back to Lerwick for my own programme. 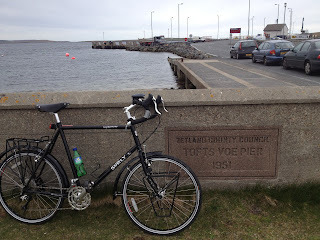 Anyway, I need to cycle the Shetland section of the route before I go off to start the bit awa' sooth. That's 18 miles from Lerwick to Voe, 10 from Voe to Toft (Yell ferry terminal - there are three big islands in the Shetland group, Mainland, Yell and then Unst at the top) then the 18 miles across Yell. 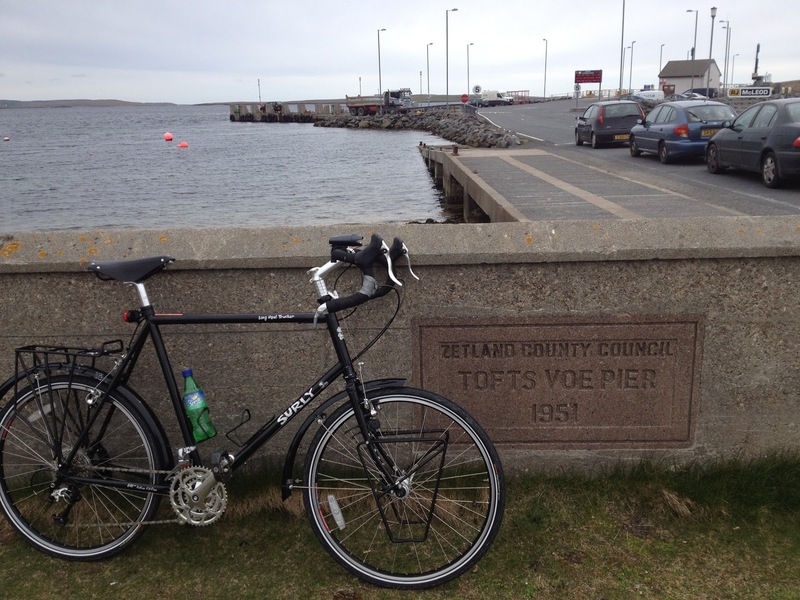 Today I did the 10 miles from Voe to Toft, with another 13 added in for training purposes (actually, to get back to where I'd left the car). And it was fine. 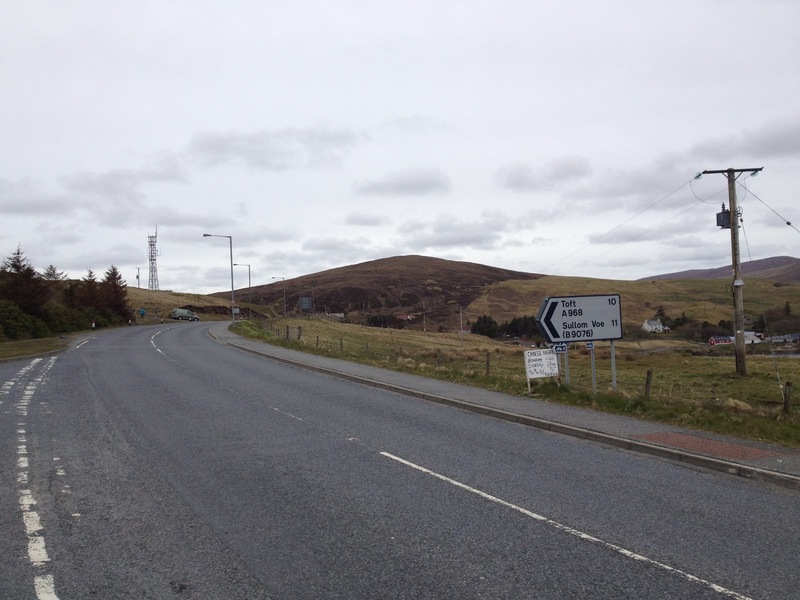 The run from Voe to Mossbank is a series of dips and then a long slow climb (see it at BikeHub here) to 300 feet above sea level above Dales Voe, on the A968, Britain's most northerly A road. Then there's a ferocious descent (hitting 40mph according to my new cycle computer) down to Mossbank, and the site of the new Laggan-Tormore gas pipeline's landfall, followed by a corkscrewing climb and a series of dips'n'rips until the Toft terminal appears. First 10 miles of the Mull2Muckle done (see pictures below). Then I simply retraced my derailleur-crunching to Voe, including the dreadful (3-4 mph) ascent from Mossbank. I'd left the car back along the road to Brae, which accounts for the extra three miles. All done on muesli, oatcakes and dried apricots! Weather (it was cool, dry, dull and slightly breezy from the east) permitting, I'll tackle Lerwick to Voe this week, with the Yell section next weekend.